I thought may be Swarovski or Chinese for this one. I've checked out a few links without success. It looks like a chrysanthemum and has four green leaves spaced around the flowers pink stem (the leaves are not attached to each other, or to the flower stem). If Swarowski it should be acid etched somewhere Anne. All the bits I've seen have been - although sometimes it's quite hard to spot the mark as it can be small and/or faint. Looks like a classic Chinese crimp to me, but it's unusual to see them with facets :shock: Interesting effect! Is it just the picture, or does the glass have a very slight yellowish tinge to it? This also is characteristic of some Chinese glass. Thanks Anne and Leni. I thought it could possibly be Chinese - the chrysanthemum type flower just struck a cord. There's another Mdina pw in the shop for Â£3. Its really lovely with typical blue/green/ochre swirls, but it has a flattened top which I can't make sense of? It doesn't add anything to the appearance, design wise. Is this quite common do you know? I know nothing about Mdina I'm afraid! :? That sounds quite possible Max, its certainly big enough to have had a seahorse on top It does look a bit odd as it is, so I won't be going back for it. 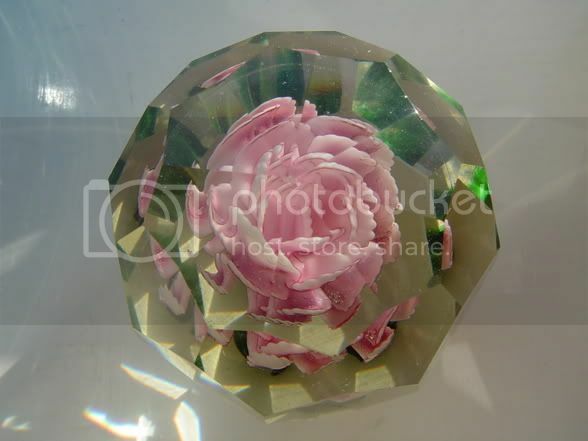 It's definitely Modern Chinese and the flower was made via applied petals, not with a crimp. They come up on ebay with some regularity though they're not as common as most other modern Chi designs. 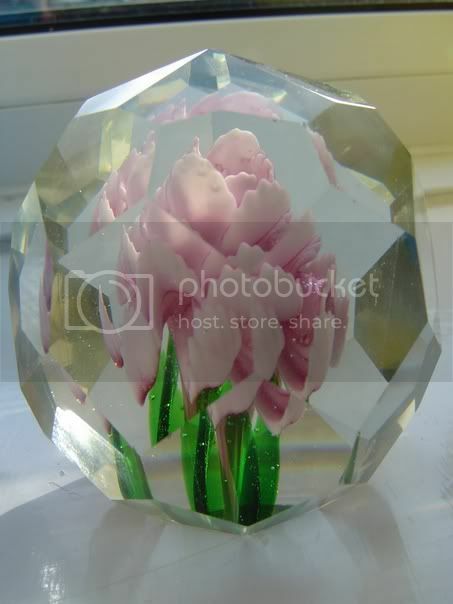 Has Swarovski ever made paperweights with encased flowers? Page created in 0.708 seconds with 28 queries.